Here’s a bit of embroidery inspiration for you from Judith, a reader here on Needle ‘n Thread. I love this, and I think it’s a terrific idea for a hand embroidery project. 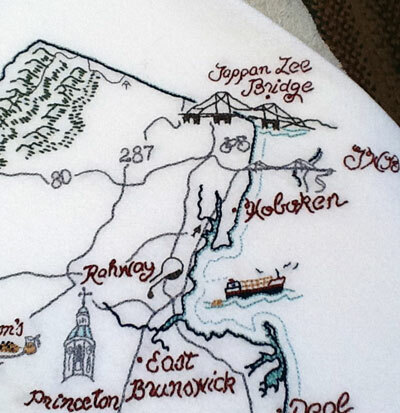 As a Christmas gift for her daughter and to commemorate their home state of New Jersey, Judith embroidered this towel with a map of the state, which included all kinds of special-interest details on it. You can see the Tappan Zee Bridge there in the background – love it! There’s the lighthouse at Cape May! 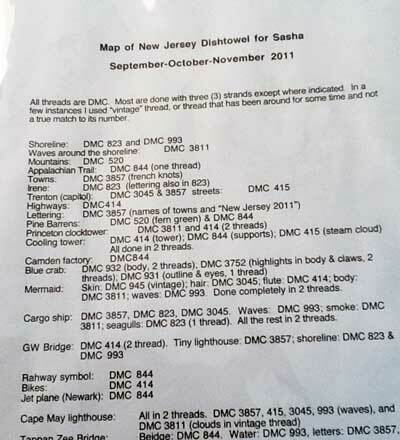 And in the water just off the eastern shore – I think that’s the official New Jersey Mermaid. 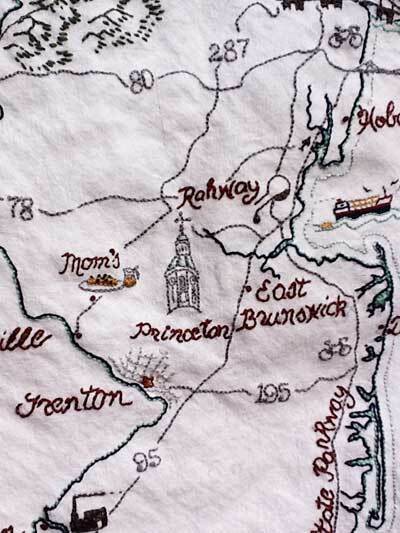 Central New Jersey is marked out with notable places, like Princeton. And Mom’s! Judith is organized and diligent when she works a project! 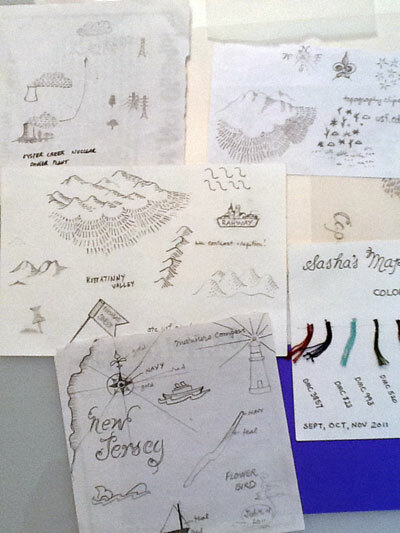 Here, you can see all her sketches, along with her thread color card. She even keeps thorough notes on each project she works. This note-keeping on embroidery projects is a good, good lesson. It makes recreating a project (if you ever want to) much easier, and good notes can often serve as a spring-board for other projects. 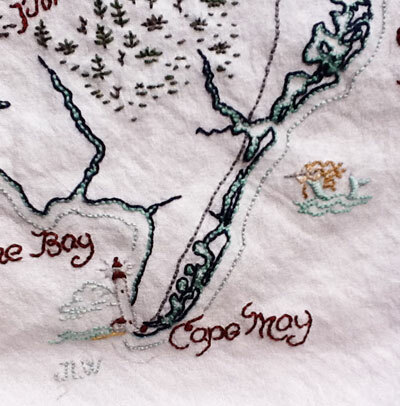 Judith’s best tip on embroidery projects: when you’re finished with a project, take it somewhere and have a full-sized color photocopy of it made. That way, even if you give away the project, you always have a clear record of it. You could also use a good digital camera and have a large high resolution print made of a good photo of the project – just as long as you have something tangible to put in with your record of the project. I thought you’d enjoy seeing this project, because it inspires on several levels: 1. the idea is great – a personalized map of a significant place in one’s life would make a very special gift; and 2. the organization and method behind the project is a good lesson for all of us! Thanks, Judith, for sharing your photos! And congratulations on completely such a fun and fabulous project! You can see many examples of Readers’ Embroidery Projects here on Needle ‘n Thread. If you’ve finished a project recently and would like to share photos, drop me a line – it’s so much fun to see what other stitchers are up to! I’m amazed at the detail – and it’s beautiful! Judith, thank you for taking the time to share it and Mary for sharing it with us. What a beautiful idea for a gift. It sure gets the ole wheels turning for future gifts! I am constantly amazed at the ideas for embroidery – there’s no end! I love this Judith! It’s amazing! I love that you designed it and the finished product. Wow!!!!!!!!!!!!!!! And I admire your organization too!! Hey! That’s fun!! And so familiar! Charming details. A lovely gift for a daughter. Admirable organizational skills. Mine would end up a UFO for sure. What a great gift, and wonderfully done, Judith! How Nice! How talented! How personal! Thanks for sharing. Beautiful!I love the details. Thank Mary and Judith for sharing. I love it! Projects like this are perfect for learning the geography of a place … creative and practical too. This ex-West Windsor, New Jersey girl thinks New Jersey never looked so good ! Inspires me to map out my favorite travel across the globe and mark the beloved sites. Bermuda and the Sizzle Inn anyone? Brilliant idea and a wonderful job! this is just too cool! I’m more of a counted stitchers, but this is very inspiring! another good idea to document the work you’ve made, especially if you are gifting it, is to start a scrapbook. i include snips of the thread, fabric etc. I love this! As a former Jersey girl this is just wonderful – really. I would be impressed with the work itself, but the organization of the entire project is even more impressive and I plan to take a leaf from your book in terms of not only project planning but saving information about each project. Very inspirational! Thank you so much for sharing. I forgot to ask – are you considering doing this as a kit or a pattern for other Jersey afficianados and residents? 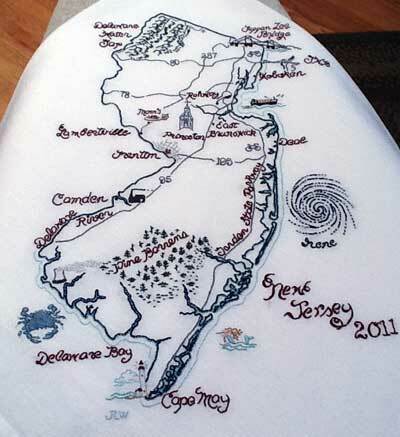 I think kits would sell like hotcakes (you can sign me up for one) and I for one would love to work this map of Jersey. Ambitious stitchers could add their own places of signifigance. That is a wonderful piece of work, Judith, congratulations. Nobody else has asked and nobody has told: does your daughter like it? Actualy, she loves it. She calls it her state/adventure towel. That is amazing – so clever. I absolutely love this and am inspired on a number of levels. First a home state map project is infinitely customizable– I want to do one. But the notes and color chart are a revelation. I keep some notes but not nearly so thorough or organized. Thank you for sharing this! What a great project, and so customizable! I admire Judith’s note taking ability, she is so thorough. I especially like that she put in Irene. We were in Connecticut and got out about eight hours before she arrived, although my son got to meet her. Previous Previous post: Stitch Play: Play!